Are LEGO Minifigs Actually Living In A Post-Apocalyptic Wasteland? The life of a minifig seems pretty sweet: You've got a rotating cast of cool gigs to choose from, a decent selection of shrunk-down monuments within easy walking distance, and all the cube houses you can snap together. 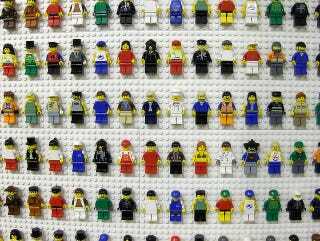 But is there a darker side to minifig life, that we've failed to see? Depending upon how you interpret it, LEGO City can be anything from a virtual utopia full of literal shiny, happy people, or a nightmare. I mean, it very much appears to be this bucolic, charming, idyllic land, full of smiling people - and of course, you can shape it to be however you want! Everything really is awesome. Yet at the same time, any AFOL who shops for City sets is acutely aware of the overwhelming preponderance of firefighters and cops (to appeal to kids with action-oriented slices of daily life), so it can really seem like this happyfunland is actually some sort of apocalyptic, crime-ridden, disaster-plagued badlands, where everything is constantly either being robbed or on fire. Plus you have to live with only seven points of articulation in your whole body. What say you — is it a plastic paradise, or just an exceptionally well-manicured hellscape? Tell us in the comments.